Hopping Over the Rabbit Hole chronicles the rise, fall, and resurgence of SkyBridge Capital founder Anthony Scaramucci, giving you a primer on how to thrive in an unpredictable business environment. Success is hard work, and anxiety, and tiny hiccups that can turn into disaster with a single misstep. This book shows you how to use adversity to your ultimate advantage, and build the skills you need to respond effectively to the unexpected. 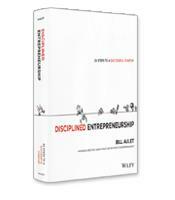 Hopping Over the Rabbit Hole gives you the skills, insight and mindset you need to be one of the winners. Growing up on Long Island, young Anthony Scaramucci had only one dream: to own his own company. 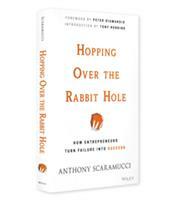 In his book, Hopping Over the Rabbit Hole: How Entrepreneurs Turn Failure into Success, Scaramucci, a hedge fund manager and conservative TV personality, recalls his success in building up his Long Island Newsday paper route through hard work and creativity. He would, for example, get free newspapers from his managers and deliver them to houses that did not subscribe, then follow up with a visit the following day, asking the “nice ladies at the door” if they enjoyed the free paper and would like to subscribe. They often did. In Hopping Over the Rabbit Hole, Scaramucci combines colorful and well-described biographical details with how-to advice drawn from the stories that end each chapter. 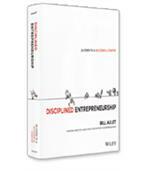 The result is a solid overview of attitudes and approaches that can help entrepreneurs succeed. Don’t spend money on the wrong things. Scaramucci describes visiting the offices of a new investment company at the request of a mutual friend. The founder of the company, a highly respected bond trader, leads Scaramucci on a 40-minute tour of the sumptuous offices, with long discussions about the furniture and art collection. When Scaramucci returns to his own offices, he warns his friend that the bond trader will be out of business in one year. Don’t think you can do it alone. “Given my lecture about the perils of excessive overhead, this may strike you as ironic, but another common mistake people make when starting a business is not hiring enough people,” Scaramucci writes. Hiring the right people — “like-minded, driven people who believe in the vision of the company and complement your skill set,” he writes — is an important key to entrepreneurial success. Don’t overcomplicate your idea The simplest ideas are usually the best, Scaramucci writes. Buying his first bottled water in 1985 in London, he thought the concept “was a joke.” He was drinking Evian only because it was better than the “brown sludge coming out of my faucet.” Today, Scaramucci still drinks Evian every day — and he is not alone: Americans drink more bottled water than milk or beer, he notes. Don’t reinvent the wheel. Many great companies and entrepreneurs don’t reinvent the wheel; they adapt and improve it, Scaramucci writes. Virgin Airlines, which has brought back comfort and style to air travel, and Apple, which did not invent the cell phone but only made it “cool and intuitive,” are examples of great products and services emerging from reimagining what already exists. Scaramucci also has stories and lessons about bouncing back from adversity, finding the right partners, avoiding turning negotiations into a war, never holding a grudge and building relationships, among other topics in this entertaining book.